Before I tell my story I would first like to say how greatfull I am that my donor and his family gave me a second chance in life. With out my donor and his family I do not think I would have lived another day. I say family also because my donor was not even a donor. At the time when my donor had his stroke that took his life South West Transplant talk to the family about the importance of organ donation and the family decided to donate his organs. 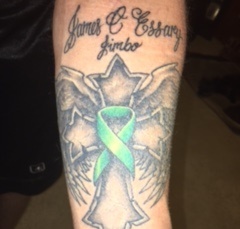 After my transplant I had a tattoo put on my left forearm with angel wings a cross and a green ribbon in the middle in memory of my donor. After writing 3 letters in the year and 3 months of my transplant I got a letter back from my donors sister who made the call for him to be a donor. I have since talk to her but not yet got to meet the family. But I am proud to say I found out my donors name. My next step then was I finished his tattoo and put James full name and dates on his tattoo. So now when people ask do I know who my donor was I show them his tattoo and say this man here saved my life. I am proud to show this tattoo to people to show my respect and show how greatfull I am that James gave me a second chance in life. My story starts on May 21 2013. That morning I out of no where I started throwing up blood and just not feeling good. Me and my wife went to the hospital about 4 that morning. The doctors said there was something definitely wrong and admitted me into the hospital. By 4 that afternoon I had liver,lung, and kidney failure and was bleeding out my esophagus. The told my wife I would not live through the night. I will be honest I do not remember much but I fought for my life and barely walked out the hospital 12 days later. The next month I was still getting worse so in July I went to a liver specialist to find out what the problem was. So after test my liver doctor got me and my wife in a room to tell us I had a rare disease called Alpha 1 Antitrypsin Deficency. He then told us I would not live three months to even start to take test to get on transplant list for a new liver. The fight began and I started seeing other doctors and also from this disease I had full blown emphysema. Alpha 1 is a genetic disease that attacks your lung or liver and it got me on both of them. My liver was already far gone but they was able to help the emphysema. So the only cure for Alpha 1 would be a liver transplant. So the next 3 months i fought and made it to start testing to get on transplant list. So from the start in July I was in and out the hospital Baylor Fort Worth 20 + times fighting for my life. I finally got on transplant list and went straight to # 1 in my category with blood and such. A few days later April first I got the call for a liver in Baylor Dallas. This is where my story really takes a crazy turn. I was showering off with the bacteria soap fixing to get my life saved and the nurse stopped me and said Donnie u have lost the liver because u have no insurance. My parents even offered to write them a 375 thousand dollar check but it was to late the liver already went to the second man up. Come to find out the company I worked for, for 13 yrs let me go but let me keep my insurance as long as I paid for it. I was even 3 months ahead on my payments. Come to find out that company dropped my insurance with no warning or letter telling me that I had no insurance. What\\\\\\\\\\\\\\\’s really crazy is the insurance dropped at midnight that day I got the call so I missed having it by 8 hours. The company refused to take my calls or my wife\\\\\\\\\\\\\\\’s to explain why they did this to me. I guess this really broke my spirits because my meld score at that time was a 28. A meld score shows how sick u are and a 40 meld score u are almost dead. In the next4 weeks my meld score went up drastically to a 38. In these 4 weeks I was so sick they gave me no chance to live because I was to sick for the doctors to even waste a liver on me because I couldn\\\\\\\\\\\\\\\’t handle the surgery. Now it\\\\\\\\\\\\\\\’s around April 17 2014 and I was in the hospital fighting for my life but there was just nothing they could do so they sent me home. But at this time a was barely well enough to be on the transplant list. 5 hours after getting sent home my body changed even worse. I was always cold of course because I was having liver failure. But this night I was sweating so bad and I told my wife this is the night I die I cannot fight this disease anymore. Oh course the wonderful wife I have was doing what she could to get me back to the hospital. It went on for about 30 minutes and then someone upstairs was looking down on me and a call came through from Baylor Fort Worth and said we have a liver for you. So on April 18 2014 my life was saved by James C Essary my angel now looking down on me. My surgery was a huge success and I am doing great now. I know volunteer for Life Gift and South West Transplant to give back to what saved my life. I have also recently received the Newman award for all my volunteering in The Dallas/ Fort Worth area. I also speak to interns about the importance of organ donation. I\\\\\\\\\\\\\\\’ve been to a couple of Baylor hospitals and raised the Donate Life Flag and spoke to the staffs about how my life was saved by organ donation. So in closing I am a blessed and lucky man to have my life saved by James and his family which I hope to one day meet them in person because in my eyes they are apart of my family now. #DONATE LIFE SAVED MINE!!! Thank you for reading my story.